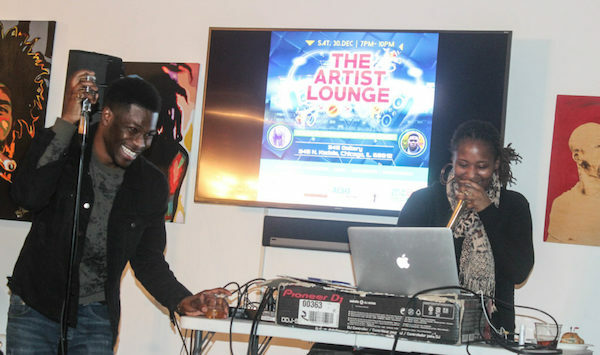 At Chicago’s the Artist Lounge Open Mic one night last July, basslines and soul bumped hard to usher in poet and DJ Johnetta “Awthentik” Anderson and radio journalist Dometi Pongo, the series’ twenty-something creators and co-hosts. Through their comedic rapport, Anderson and Pongo kept their audience’s young poets and teens laughing and engaged and prompted the large crowd to think about black writers, respectability politics, and relationships. Held monthly at local art galleries and cultural institutions, the Artist Lounge Open Mic gives people a space to celebrate and affirm each other in a warm, familial atmosphere. At the event I attended at the historic South Side Community Art Center, a six-year-old kicked off the evening with a verse from Billie Holiday’s “God Bless the Child.” Performers shared memorized poems about family, relationships, gentrification, hip hop, and childhood memories, and some had music to back their verses, amplified by a vintage Shure-style microphone. Pongo and Anderson traded off on jokes and introductions, and there was a rich sampling of songs by Bob Marley, Jay-Z, Remy Ma, and Schoolboy Q.
Teeming with artistic energy and artifacts, the South Side Community Art Center is a fitting location for the Open Mic. Founded in 1940 by the legendary artist, poet, and educator Margaret Burroughs through the WPA’s Federal Art Project, the Center was the United States’s first black art museum and attracted many notable artists, including photographer Gordon Parks, painters Eldzier Cortor and Archibald Motley, musician Nat King Cole, and poet Gwendolyn Brooks. The building’s Bauhaus-style architecture is still intact, and the Open Mic is often held in the first-floor gallery, where Brooks enjoyed writing and Cole played the piano. Playfully referred to as “DJ Westside Smack Yo Mama,” Anderson spun the lyric “I love myself” on repeat and nudged people to say it in unison at least ten times. “I want people to leave feeling loved and affirmed,” she said. The Open Mic’s featured artists include mainstays of the Chicago spoken word and performance scene, like visual artist and poet Oscar “Triple Blak” Lester; Khari B, who has performed with world-renowned jazz musicians; Harmonia Rosales, who went viral for her painting of God as a black woman; and up-and-coming emcees Bella Bahhs and Goalden Chyld. Other notable Open Mic stars are Solomon Adufah, Akenya, Harold Green, and Chai Tulani. All photos by Antwan McHenry. In a space that vibrates with the ancestral energy and images of artists that reflect their experiences, young poets are finding their voices. 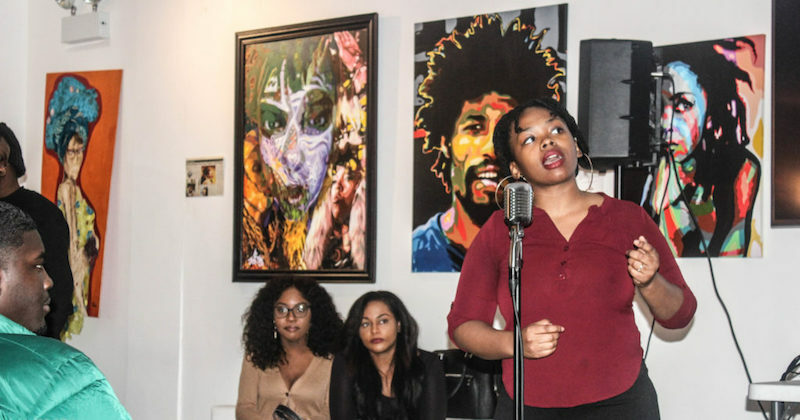 Like the Cave Canem, Kimbilio, and VONA workshops, the Artist Lounge empowers emerging writers of color and is a spot for young authors to connect. But the Artist Lounge is steeped more heavily in the oral traditions than the academy and is as an extension of Chicago’s famed black-centered open mics at shuttered venues—Wicker Park’s Lit-Ex bookstore; the Cotton Club in the South Loop, where spoken word star Malik Yusef held events; and Spices, the bar that served as Theodore Witcher’s inspiration for the movie Love Jones. Thanks to dedicated hosts like Anderson and Pongo, Chicago remains a fertile ground for new talent.